I remember my mother teaching me how to wash my socks and handkerchiefs by hand when I was four years old. She taught me how to cook rice when I was just eight years old. My mother loves sewing. She taught me how to sew and this became one of my hobbies. Many years later, I was so proud telling everyone on my wedding day that I made my own wedding dress. I worked as an office assistant for eight years. I came to a point where I felt so stagnant and dry sitting in my office in front of a computer everyday and talking to grumpy people over the phone all the time. I just had this feeling within me that I needed to change my career. I needed to do something that would challenge and help me to grow as a person. When my husband decided to take up a teaching as a career, he enrolled at Auckland University of Technology in Auckland, New Zealand. He would often come home and talk to me about a woman called Maria Montessori. As he explained her philosophy of teaching to me, I thought to myself ‘This really make sense.’ I called my mother in the Philippines and told her that I enrolled to be a Montessori teacher. I told her that I could teach my students everything that she taught me. Yes, it was fun going back to university. Going to university together with my husband and yes it was also nice sitting in class besides him holding hands and having coffee together. In 2008 my mother was preparing to come to New Zealand for my graduation day. We were both so happy and looking forward to seeing each other. But before she could come, my mother had a heart attack and was gone. All my lecturers and classmates were so supportive of me during my time of grieving. They supported me emotionally, physically and financially to be able to cope at such a time of need. I soon realized that the Montessori was more than a philosophy; it was a way of life. I could see it fully manifested in the hearts of the people that poured out their love for me and my family. 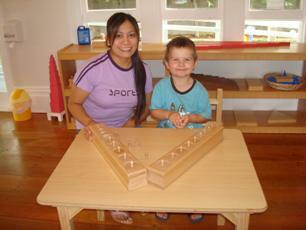 I started working in January 2009, at a Montessori preschool in Auckland, New Zealand. I believe that the effectiveness of a teacher or educator reflects on the effectiveness of her/his environment. I really like the fact that a Montessori classroom is always attractive for both the children and their parents. The materials are presented in a way that is attractive and elegant, prepared and designed to attract the child’s interest and attention.The Montessori ‘prepared environment’ is always innovative and with opportunities for experimentation by the child. Being a Montessori teacher is not just dispensing knowledge to the child but giving an education that will aide the child’s life. Are we filled with the spirit of love? Are we inspiring wonder and admiration in our children? Are we looking at the potential of the child? The more we can answer yes to these questions, the more we touch the hearts of the children and educate for peace. It is my dream to one day own and operate my own preschool. It would be really good if I could start my own Montessori centre here in New Zealand or in the Philippines. I hope to share and create more windows of opportunity to be able to contribute to the well-being of our children now and the children of the future.